The passenger compartment remained stable in the frontal impact. The airbags of both the driver and the passenger were not sufficiently inflated to prevent the head 'bottoming out', through the fabric of the airbag, against the steering wheel and dashboard, respectively. Although dummy readings were not compromised, the score was penalised and protection of the head was rated as adequate. 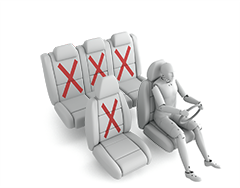 Similarly, dummy readings indicated good protection of the knees and femurs of the driver and passenger. 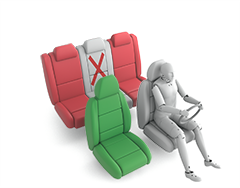 However, structures in the dashboard were considered a risk to occupants of different sizes or to those sat in different positions and protection of the knee/femur/pelvis area was rated as marginal. 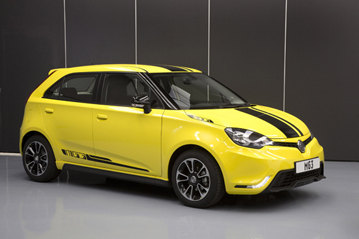 In the side barrier test, the MG3 scored maximum points with good protection of all body regions. In the more severe side pole test, dummy readings of chest compression indicated marginal protection of this body area. 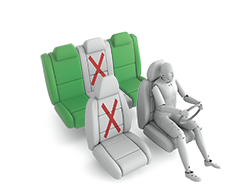 Protection against whiplash injuries in the event of a rear-end collision was rated as marginal for the front seats and poor for the rear. Based on dummy readings in the dynamic tests, the MG3 scored maximum points for its protection of the 1½ year infant. In the frontal test, forward movement of the head of the 3 year dummy, sat in a forward-facing restraint, was not excessive. However, chest and neck loads indicated only fair protection. A switch is available on some grades of the MG3 which allows the passenger airbag to be disabled. On vehicles which are not equipped with the switch, a rearward-facing child restraint should NOT be used in the front passenger seat. Early versions of the user manual are incorrect and indicate that the front passenger seat is suitable for a universal child restraint. As the switch is not standard equipment, the system could not be awarded points but an assessment indicated that information provided to the driver regarding the status of the airbag is not sufficiently clear. All of the child restraints for which the car is designed could be properly installed in the vehicle, except for the universal group 1 in the rear outboard seats. In these positions, the child restraint is not supported by the seat back, allowing rotation of the restraint. The protection provided by the bumper to pedestrians' legs was good or marginal. However, the front edge of the bonnet offered poor protection in all areas tested and scored no points. The bonnet was generally adequate over its surface with poor protection provided along the stiff wing edges and windscreen pillars. Electronic stability control is standard equipment on the MG3, as is a seatbelt reminder system for the front seats. The car is not offered with lane support, speed assistance or autonomous braking.